The year 2018 has been declared the third International Year of the Reef (IYOR) by the International Coral Reef Initiative (ICRI). 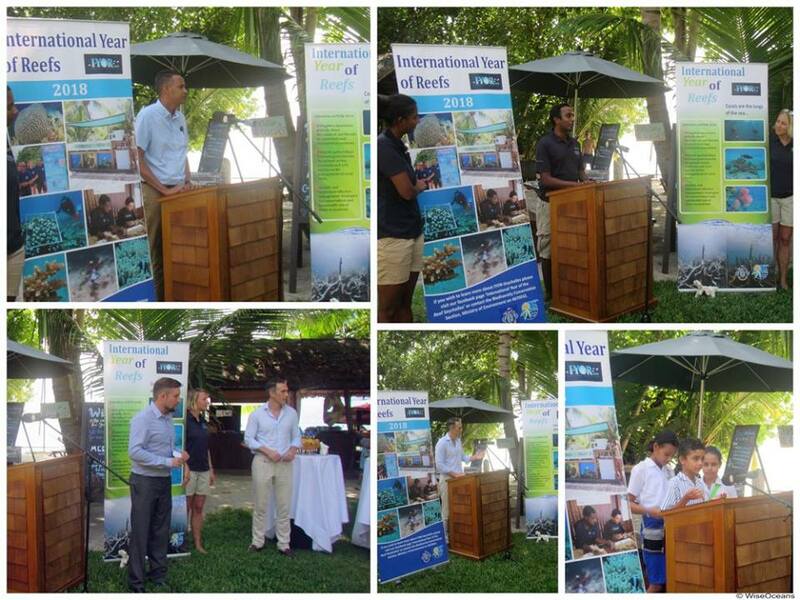 In the Seychelles, the ceremony to launch the third IYOR took place on Wednesday 9th May at the Four Seasons Hotel and organised by marine conservation & education company WiseOceans and Ministry of Environment, Energy and Climate Change. Officially launched by the Principle Secretary Mr de Comarmond, with several key partners in attendance including the Principal Secretary for Tourism Mrs Lafortune, the Seychelles Island Foundation, Marine Conservation Society Seychelles, University of Seychelles as well as school children from the Baie Lazare school. Seychelles is a nation with the ocean at its heart and one which economically, socially, and environmentally relies heavily on its coral reefs for coastal protection, tourism and fisheries. Therefore, the 2018 IYOR is a great opportunity to both celebrate Seychelles’ coral reefs, and to get together to discuss what can be done to make their future look a little brighter. The Ministry of Environment, Energy and Climate Change, non-governmental organisations and stakeholders from the public and private sectors, have come together to form a Seychelles IYOR steering committee, and over the coming months will be holding public events and activities to raise awareness of and promote Seychelles’ coral reefs. These include the 2018 IYOR launch ceremony, a social media campaign, activities in schools, IYOR information stands at public fairs, a series of public seminars, a coral symposium and screenings of coral reef related documentaries.